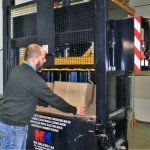 INDO Lighting approached KK Balers for a solution to their cardboard waste problem and, given the waste turnaround of the company, we recommended a KK 18 Baler. INDO is a pioneering manufacturer of Direct Drive LED street lighting systems, bespoke retrofit solutions and induction lighting equipment. Using advanced technologies and only the best quality components, INDO’s reputation as the innovative supplier of choice is growing amongst specifiers of exterior lighting. A bespoke solution was made for INDO Lighting as their cardboard boxes are unusually wide. The KK Engineer increased the retaining claws as the company needed to put 3 batches of card in each loading. These had to be held down in order to maximise each load. 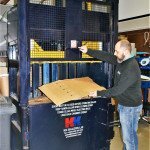 Prior to using the baler, cardboard waste was placed in a small compactor, where boxes had to be manually broken down to fit inside. This exercise was becoming increasingly labour-intensive during production and unnecessarily diverting attention from value-added tasks. 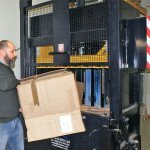 With the baler installed, production lines are now able to flow without constant stoppages to break down boxes and clear space for stock. We calculated that the previous compactor was taking up 26 minutes of production time per day (this just being the waste from one product line). With the new baler, this has been reduced to 5 minutes. The baler produces bales of cardboard weighing up to 280 kg. This has enabled INDO to recycle their cardboard, improving their environmental footprint and also enabling them to sell the bales on to a local waste management company. It also features a distortion free press ram with guides on all sides, preventing an imbalance when loaded unevenly.